News headlines in recent years tell the story of a region coping with a population boom and infrastructure management issues associated with all the new North Texans. Among those issues, none is more important to municipalities than maintaining a reliable, plentiful water supply for residents. 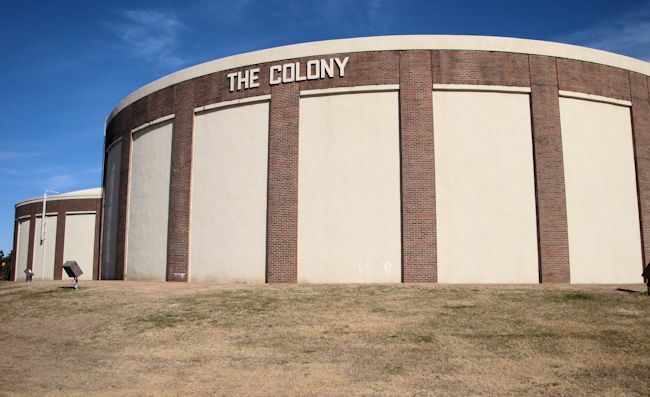 As of last year, The Colony’s water system comprised 197 miles of water line and 203 miles of sewer line, with more to come as the city continues to grow. The system is comprised of three departments: water production, water distribution, and wastewater treatment. It all begins with water production, which oversees quality, the operation of pump stations and towers, and maintenance and operation of five well sites. In 2013, 5.7 billion gallons of water was produced and entered into the distribution system. The City of The Colony receives about 60 percent of its water from Dallas Water Utilities, which gets its water from six reservoir lakes: Fork, Grapevine, Lewisville, Ray Hubbard, Ray Roberts, and Tawakoni. These water tanks at the Office Creek Pump Station receive water purchased from Dallas Water Utilities. Dallas’ water arrives into The Colony through a 36-inch line via the Office Creek Pump Station on Main Street. There, a bank of computer screens monitors the system’s overall water pressure and water tower levels. Monitoring also includes the ability to detect leaks, both big and small, and to make adjustments in pressure during emergency line breaks or other high-demand incidents. Water Production Supervisor Jimmy Arthur said Dallas is a reliable source because the city made a lot of good decisions early on in the development of its reservoir system. “They’ve got a lot of water,” he said. “But what makes us different is that we go beyond purchasing surface water and we make use of our wells,” which accounts for the remaining 40 percent of The Colony’s water supply. The newest addition to the city’s water production services, well No. 5, is located at Office Creek Pump Station. While not cheap to build, there’s not a lot of cost associated with well water once established, other than treating the water and powering the well’s mechanics, Arthur said, especially compared to the rising costs of surface water. “It can be kind of scary with the droughts we’re having and the population growth in the region, but I think The Colony is in a pretty good spot,” Arthur said. The city’s daily average of water usage this time of year is about 4.5 million gallons. During peak summer usage when irrigation is more prevalent, that number can reach about 8 million gallons per day. 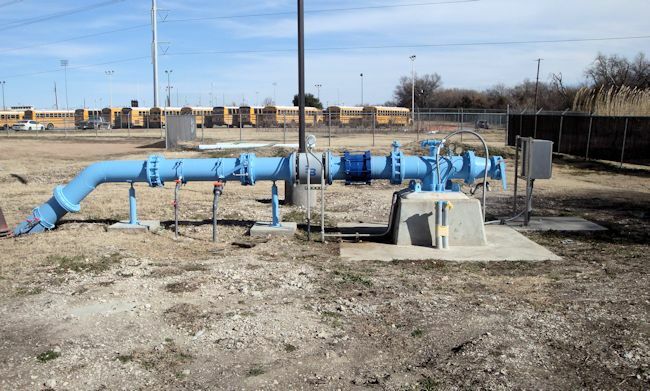 Once the water is moving through the city’s system, it’s the responsibility of water distribution to ensure it reaches The Colony’s residents and businesses and, ultimately, the wastewater treatment facility. 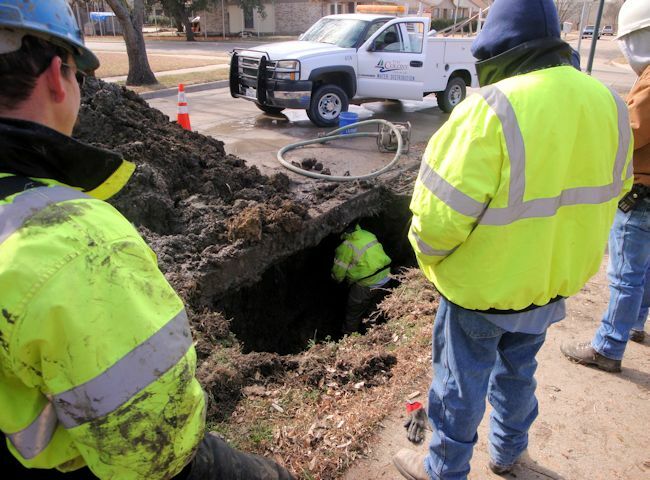 Their work entails a variety of both routine and spontaneous tasks in the field, including repairing leaks; flushing stopped sewer lines; monitoring trunk lines; line locations; and hydrant checks. Water Distribution Supervisor Joseph Chase said the number of calls they receive per day varies, but they usually run between 40 and 60 work orders a week. On this particular day, Chase’s crews are repairing a leak in a 3/4-inch line running under the street on Hamilton. The leak was caused by cold weather and old piping, Chase said. While not a large leak, the job requires significant planning. Most leaks are first identified through system monitoring or by meter readers following up on notifications from affected residents. Major or emergency repairs naturally take precedence (during which field operators work nonstop) but many jobs are prioritized on a schedule that allows for advance notification of residents. The Hamilton job started at 9 a.m. A backhoe digs a large hole in the ground between the street and the sidewalk to reach the location in need of repair. Only one operator will be in the hole at any one time, with support staff above ground to react if there’s a cave-in. The water for this job is shut off at 11:30 a.m. When possible, they’ll wait until late into the morning before shutting off anyone’s water service for repairs. “We try to let everybody get out, get to work, get the kids to school, let the traffic die down and then start digging,” Chase said. Digging through dirt is always preferable to tearing up concrete, which requires hours of follow-up repairs by both water staffers and Public Works Department employees. A dirt hole can be packed in, leveled out, and the street cleaned up all in one day. The Hamilton leak is fixed and water turned back on by 1:30 p.m. Follow-up work entails wrapping the exposed piping in plastic to minimize contact with dirt, which contains acid that corrodes the pipes. Operators also must flush the water lines to get air out of the system. Water Department workers repair a leak under Hamilton Court. They also routinely flush sewer lines. In recent weeks, a significant blockage in a trunk line near Bristol Oaks Apartments resulted in an unfortunate smell lingering in the area for some time. In this case, a large chunk of asphalt had somehow gotten into the line and kept moving until it reached a tight spot and plugged everything up. An operator was required to do a “confined space entry,” move the debris to the side to open up the line, and then break up the asphalt into pieces small enough to remove. Chase said leak repairs and sewer flushing is hard work and takes a lot of energy. Much of the water in the system eventually ends up at the wastewater treatment plant off East Lake Highlands Drive. A single trunk line enters the plant on its eastern side. “The entire city’s waste, from whatever goes down the drain, toilet, dishwasher, or washing machine, from Austin Ranch to every business in the city, comes through right here,” Lead Operator Kyle Simmons said. Five staffers work rotations at the treatment plant, sharing duties from lab work to walkthroughs and maintenance, lift station collections and cleaning algae off the UV treatment lights, among other tasks. The facility is monitored 24 hours a day, seven days a week. All of the wastewater from the trunk line is first lifted by a series of pumps to a collector that filters out inorganic materials like toilet paper, solids, and “stuff that the bugs and other processes at the plant can’t treat biologically”, Simmons said. Those bugs take over in the next step, where the water churns through a trio of large open-air basins full of chemical processes that break down ammonia, phosphorous, and pathogens. “The goal is to remove anything that might be harmful to the wildlife,” Simmons said. The basins include flow mechanisms that are designed to continue removing solids and reproducing bugs at an optimum balance so that the clearest effluent moves on to the UV phase of the treatment process. Scooping out a sample of the final product from a spillway that feeds Lewisville Lake, Simmons holds it up to the sunlight to show perfectly clean-looking water. The wastewater treatment facility treated 981 million gallons in 2013. Looking ahead, plans are in the works for a major upgrade to the plant, which would increase its capacity from 3.8 million gallons per day to 4.5 million gallons in Phase 1 alone. The increase is primarily required in order to meet the demands of future growth. Leo Lavender, Director of Public Services for The Colony, feels confident the city is doing everything it can to prepare.